Is Keep Pipe just as effective as regular Rien Pipe in helping me quit? The full Rien Pipe kit contains 31 filter attachments, each of which cuts an additional 3% of nicotine from the smoke you inhale. 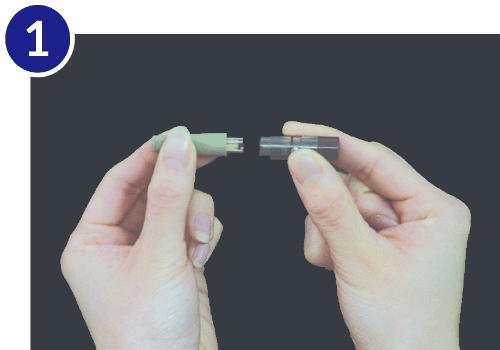 The final filter – Pipe #31 – cuts 95% of nicotine. The $34 Keep Pipe set contains 10 Rien Pipe #31 filters. It is intended to be used by people who have used the full Rien Pipe kit and who have washed and re-used the final #31 filter until it has become difficult to get rid of the tar deposit on the inside. Most Keep Pipe customers are not yet ready to completely give up smoking, though they wish to remain at a low nicotine intake. Hence we created the Keep Pipe “booster pack”. Is Keep Pipe just as effective as the full kit in cutting nicotine? Absolutely. However, we do not advise going immediately to a 95% cut – it’s simply too large a jump. As opposed to getting used to gradually reduced nicotine levels over a 31-day period and increasingly diluted smoke, you would be experiencing the goal effect all at once. Also, by jumping to #31 right from the start, you may experience some of the frustration and irritation associated with nicotine withdrawal – which is exactly what the full kit is intended to avoid. For all this, we strongly recommend against attempting to stop smoking with the Keep Pipe alone and instead use the full Rien Pipe kit. Rien Pipe makes use of the technology of micro-holes that are bored into each pipe. These regulate the amount of nicotine contained in the air flowing through the pipes into the smoker’s body. Unlike e-cigarettes and other cessation aids, Rien Pipes do not contain any chemical substances, nicotine, herbal extracts or other additives, which means they are safe when used by a woman during pregnancy. Does Rien Pipe have the same effect for both men and women? Yes, Rien Pipe has the same effect regardless of whether you are a man or a woman. There may, however, be slight differences in the success rate among individuals. These depend on such factors as the length of your smoking history (for how many years you have been smoking before you tried to quit), as well as your mental condition (the degree of your psychological dependency on tobacco), etc. Are there any age limitations for starting Rien Pipe? If you are a minor, you will need your parent’s or guardian’s permission when you order and and purchase our product. In case of seniors, there is no upper age limit as our program doesn’t require any drug prescription or direct medical supervision. Can I start with the Rien Pipe program even if I suffer from a chronic disease or have some other serious health condition? Even if you are a smoker suffering from chronic obstructive pulmonary disease (COPD), asthma or another smoking-related disease, Rien Pipe may help you stop smoking. As there are no chemicals or other substances used in Rien Pipe there are no potential side effects. Please note, however, that Rien Pipe is not intended to diagnose, treat, cure or prevent any disease. Is Rien Pipe safe to use? Unlike most filters, which use fine fibers or charcoal that can be inhaled along with smoke, Rien Pipe uses a very different technology to decrease inhaled nicotine when smoking, and adds no additional particles to inhaled smoke. The body and mouthpiece are made of non-toxic plastics, with Pipes #2-4 containing a tiny aluminum element. Rien Pipe contains no nicotine, drug, chemicals or additives of any kind. Also, Rien Pipe’s tar-catching core has the ability to catch additional tar missed by the cigarette’s built-in filter. Tap here to see what Rien Pipe is made of. Will I really be able to stop smoking with the Rien Pipe program? According to our in-house survey, over 70% of Rien Pipe users have succeeded in quitting. The key to their success is using the pipes sequentially – in the right order – for 31 days*. By doing so, they were able to reduce their intake of nicotine even while smoking. Most users are able to successfully quit smoking because they followed a simple rule: use a pipe with every cigarette you smoke. The majority of those who fail to stop smoking with Rien Pipe have broken that rule, because they don’t really want to stop smoking. Even if your nicotine dependence is eased, as long as you intend to smoke, you won’t be able to stop smoking. You don’t need to have iron willpower to stop smoking, but you do need to keep thinking about quitting smoking and take positive steps toward changing your lifestyle by adopting non-smoking habits. *31 days is the expected stopping period for cigarettes containing 0.1mg nicotine. An extended quit schedule is necessary for cigarettes containing more than 0.1mg nicotine. Individual results may vary. Visit here for more information on making a quit smoking schedule. I’m on Pipe #20 and it seems I’m smoking more. Is that normal? Some people have experienced this phenomenon, particularly from around Pipe #15-20 onward. At this point, your body is still getting accustomed to receiving less nicotine than before. For most people this increase is temporary, and we would recommend not stressing over an increase in the number in cigarettes smoked, as this desire will ultimately begin to wane. Keep in mind that even if you smoke more cigarettes later on in the series, the actual amount of nicotine that you are inhaling is likely still less than what you had earlier. If you are curious, you can approximate the number of cigarettes you are smoking on a given pipe using the table below. For example, if you smoke 30 cigarettes a day and you’re using Pipe #15, you are actually smoking the equivalent of around 16 cigarettes that day (=30 x 0.545 = 16.35). If I smoke 5 cigarettes per day, I will use filter 1 for 5 times than discard them the next day? How does this work? The general idea is 1 filter per day. Whether you smoke just 3 cigarettes or 2 packs a day, you will still use that day’s filter for all cigarettes smoked. As you smoke, the Rien Pipe filter will become coated with tar and may begin to smell too. For this reason, we suggest that people periodically disassemble the Rien Pipe, wipe it clean with a cloth or tissue, and reassemble. If it becomes particularly dirty, you may choose to wash the tube with vinegar, alcohol or a mild soap in order to dislodge the tar. Depending on the nicotine content in your cigarettes, you may need to reuse a pipe earlier in the series. Some customers reported going on a business trip and leaving the Rien Pipes at home. They then smoked without Rien Pipe and when attempting to resume the series, found it difficult. However, they had thrown away earlier Rien Pipes in the series and decided instead to give up on quitting. For these reasons, we recommend cleaning and keeping the Rien Pipes in the original foil until you have quit. Each Rien Pipe has a number imprinted in it for identification (shown to the right). I was away on business for a week and forgot my Rien Pipes. Should I just pick up where I left off? Smoking for even a few days without Rien Pipe is unfortunately enough to return the nicotine levels in your body back to where you were before quitting. Generally, we would recommend starting again with Pipe #1 and going forward from there. If you have only missed a day, you may not need to return to Pipe #1. Instead, you may find that one of the earlier pipes in the series feels comfortable enough. In this case, we recommend returning to the pipe that’s most comfortable and proceeding with the program from there. I’ve noticed that there is an aluminum part in the place of the micro hole in all the pipes I was using at the beginning, but I couldn’t find any in the pipe I am using now. Could these be defective products? Except for pipe No. 1, each pipe has a micrometric hole that is drilled using patented ultra-precision technology. These microscopic holes or micro-pores are particularly fine in pipes No. 2-4 that it is not technically possible to drill such an opening into a plastic material. For this reason, tiny aluminum plates are used in pipes No. 2-4, while all remaining pipes in the series have a hole drilled directly into the plastic tube. That is the reason why certain pipes don’t have aluminum plates. However, it does not mean these are defective products, so please use them as usual. I’ve used all the pipes in the Rien Pipe program, but still I’m not able to quit smoking. What might be the problem? The reason why quitting smoking is so difficult is that your body has to deal with the problem of dependence or in other words — addiction. While you’re physically addicted to the regular batch of nicotine you are getting from smoking, you are depending also on the sole act of smoking itself: you are used to holding the cigarette in your hand and in your mouth. These are the psychological aspects of your addiction. The Rien Pipe program basically addresses the nicotine addiction, and it gradually reduced your nicotine cravings to minimum. Now, the future is completely in your hands; whether you are going to be a successful quitter or not depends on your own effort and determination. We recommend to keep using pipe No. 31 after you finish the whole program, even if you still don’t feel confident enough to quit. This is to keep your nicotine intake to a minimum. I smoked without the pipe attached to my cigarette. What should I do? If you start smoking without the pipes, your body will return to the condition it was before you tried quitting with the Rien Pipe program. In fact, this is the most serious factor behind failure in smoking cessation with Rien Pipe. We strongly recommend that you never smoke without a pipe attached to your cigarette. However, if you smoked only 1 cigarette without the pipe and didn’t feel any difficulties, we recommend proceeding to the next pipe in sequence. If you smoked several cigarettes without a pipe, we advise returning to a pipe number you feel most comfortable smoking with and continue as before. In some cases it may be least stressful for you to start again with pipe No. 1. How should I clean Rien Pipe? Each pipe consists of 2 major parts -- the grey mouthpiece and the main body of the pipe. The main body is assembled from a plastic transparent tube and a brown plastic removable unit. The plastic transparent tube has a white tiny part inside -- this is the tar catching stick. 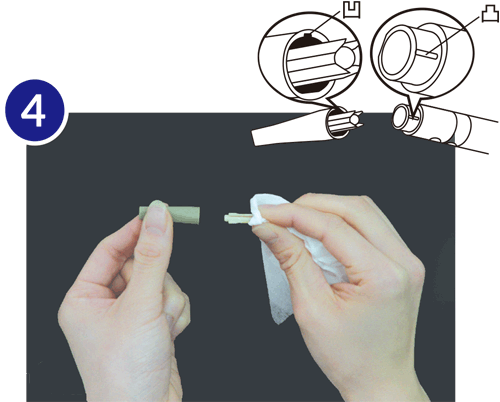 When cleaning the pipe, first separate the mouthpiece from the transparent tube, then remove the tar stick from the transparent tube holding it with a paper tissue. 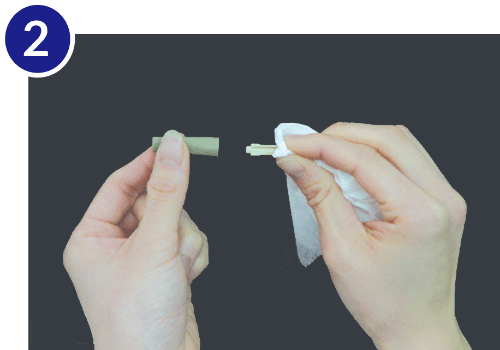 You can clean the stick and the inner part of the tube by wiping off the attached tar with a paper tissue or a cotton bud. In case too much gunk accumulates in the pipe, we advise washing it well by soaking it for a while in lukewarm water with some added dishwashing liquid or some other neutral detergent. Please be sure to dry the pipes thoroughly before using them again. Separate the mouthpiece from the body by slowly pulling them apart - not by twisting. Separate the tar-catching core using a tissue. After cleaning the pipe, insert the internal components, then align the small notches in the mouthpiece and body to re-assemble. Why should I keep the pipes for reuse? When you smoke cigarettes containing 0.1 mg of nicotine and you proceed to pipe No. 31 in our Rien Pipe smoking cessation program, by this time, your nicotine intake becomes as low as only 0.005mg. This is the level that is considered the limit value — an indicator that tells you successfully freed yourself from your nicotine dependency. If you normally smoke cigarettes containing more than 0.1mg nicotine, you will need to reuse the Rien Pipes in order to get to this same level. 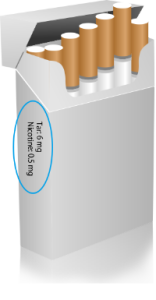 You will also need to shift to lighter (= 0.1mg nicotine or less) cigarettes. Click here for more information on which pipe number to start with at this second cycle of Rien Pipe program and check on how to clean and store the pipes to be reused. Why do I need to replace the pipe in the morning? Normally, the density of nicotine in the body falls sharply when you wake up in the morning. The reason why smoking feels more intense than usual when you get out of the bed in the morning lies in this as well. By getting a new pipe for the first smoke of the day, you can change over to a pipe that gives you 3% less nicotine compared to the previous day’s pipe without feeling any discomfort. I’ve misplaced today’s pipe. What should I do? If you’ve lost a pipe needed for the day, use the following day’s pipe. Although you may experience some discomfort, you will get used to it after a few days. You should never smoke a cigarette without a pipe just because you’ve misplaced the pipe. I’d like to quit smoking as soon as possible. Is it OK to skip over pipes? Please ensure that you use the pipes in the right order. The important thing is reducing the amount of nicotine you take in without changing the taste of the cigarette. If the amount of nicotine falls drastically in a short time, it will increase the cravings for a smoke — making you stressed and making it difficult to quit. You must use the pipes in the order as indicated, and use one pipe for the duration of a day. How many cigarettes can I smoke with one pipe? The number of cigarettes than you can smoke with one pipe is not limited per se. You only need to clean the pipes by removing the tar stick from the transparent tube unit when it gets clogged with the brown, bad smelling gunk – tar and the remains of nicotine. Replacement pipes are available from our online store if you would rather purchase new pipes as opposed to cleaning them. I ordered Rien Pipe via Amazon(R) in the US but received a Japanese guidebook. We ship all purchases via express mail (EMS), which typically takes around 3-5 days for delivery to most locations. When we process your order, a parcel tracking number will be provided to you. Your purchase may be tracked online at https://www.sayonarasmoking.com/track/. I’m from outside the US. Can I still purchase Rien Pipe? In most cases, yes, provided that your country supports payment processing via PayPal and that it is reachable via express mail (EMS). Check below to ensure your country is supported. Prices may vary according to exchange rates with the US Dollar. Note that some countries may impose additional costs for delivery and taxes. Additional information about this is available on our Policies page. Please contact us if you have any questions before purchasing. We process all payments securely via PayPal, which allows you to either pay via credit card or directly with a PayPal account. Not every country is supported by PayPal, however. A list of supported countries is available on PayPal’s website. Please contact us if you have any questions. Have a question that's not listed above? Please share it below and we'll respond swiftly.